I have to say that I often think of wicker in the grand motherly sense. It seems very old fashioned in a fuddy duddy sort of way (BTW my husband doesn't agree!). But, I was taken by the wicker I saw today at the Stair Galleries auction preview in Hudson, NY. It came from an estate in Stockbridge, MA and there is a good sized collection of interesting wicker design. 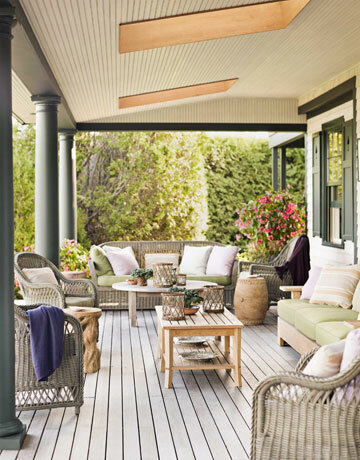 This house in Maine designed by Tom Scheerer illustrates the classic use of wicker in a Summer porch. very welcoming! This is the lot that first caught my eye. The wicker design is so unusual and, daresay, I say chic! This is Lot 40 in the Stair Galleries auction June 10th. It has an auction estimate of $300 - $400. Instant patio room! I love the wicker weave! This is a detail of one of the chairs in Lot 40. This chair is included in a larger lot in the auction that is estimated at $200 - $300 for a number of other pieces. The peacock fan style back is wonderful. This is in the same lot as the one above. I think it has quite a sophisticated design. This rocking chair is included in Lot 38 which has two rocking chairs, an armchair and two tables with an auction estimate of $300 - $600 for the group. This conjures up lazy Summer days on the porch watching the world go by! Finally Lot 42 is another instant room for an estimate of $300 - $400 for the whole set of a sofa, two armchairs, three tables and a magazine rack! I could also see this in a child's room. Wicker is quite versatile in terms of design use. 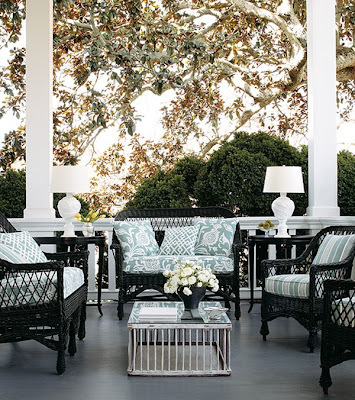 It can be used outside on a patio or porch, or inside in a casual room. It works in the bedroom, and would be a great way to furnish a child's room on a budget. I like the idea of painting it black and getting some great cushions which would dress up the set. 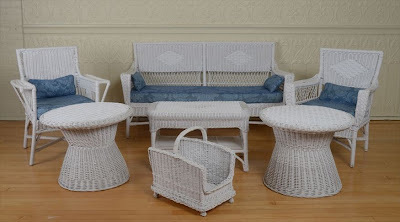 I love all of those pieces, wicker outdoor furniture, the term wicker is the weaving process of the furniture and it does not refer to the material used. 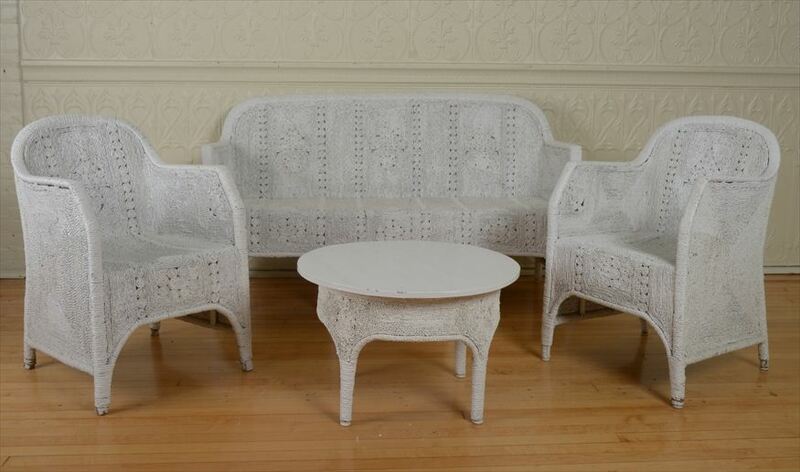 It was in the Victorian period wherein the use of wicker furniture became very popular among home owners. Outdoor wicker furniture is very ideal if you want durable and attractive furnishings to grace your garden. Its simplicity and flexibility in style adds greatly to its beauty. Antiques make a contemporary space! Own some Mark Hampton style!